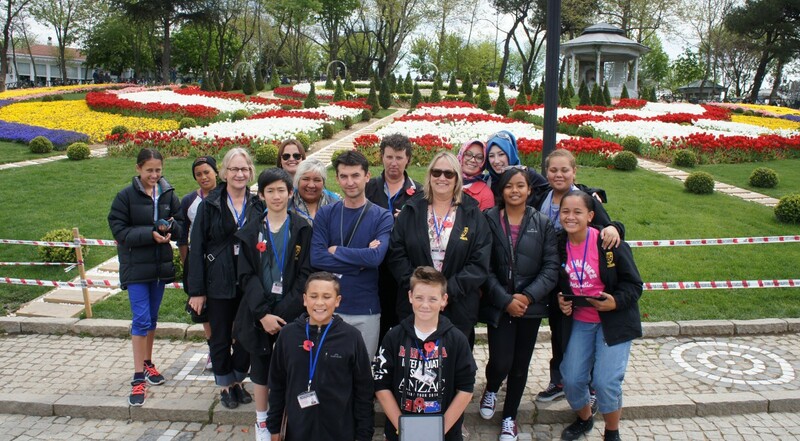 PIF ANZAC Study Tour 2014 – Pearl Of The Islands Foundation Inc.
Pearl of the Islands Foundation organised its annual ANZAC study tour that saw 8 students from Manurewa and Papatoetoe as well as 5 teaching staff attend the 2 week tour. The group began their journey in Istanbul by visiting the, once Ottoman Empire’s stronghold, most touristic and significant landmarks including the Sultanahmet (Blue) Mosque, Basilica Cistern, Hagia Sophia and Topkapi Palace. Other experiences in Istanbul involved heading up to the beautiful Istanbul viewpoint Camlica, going to the highest tower Sapphire, a Bosphorus tour and trying out Ebru Art (Water Marbling). A short ferry ride later to where the Ottoman Empire was founded in the 13th century the group arrived in Bursa. The burial chamber of fallen Sultan’s were visited, The Bursa Ulu Mosque was also very fascinating with the magnificent artworks inside. A short trip to the Uludag Mountain allowed the participants to play with snow in the freezing cold. The next destination was Izmir. The highlights of this city were a walk down the shore, Virgin Mary’s house, Ephesus and Troy. The next day, the Kiwis in Turkey headed to Gallipoli to pay their respects and represent their country. The dawn service meant that the group had to wake up at 2am to get on the VIP bus convoy. Following the dawn service and breakfast students and teachers had the oppurtunity to meet and speak with a number of important people including the mayor, ambassador and Governor General. This was followed by attending the Australian and New Zealand services. Following returning back to Istanbul, those who wanted to shop for their friends and family were able to at the historic Grand Bazaar. The tour ended with a Bosphorus tour between Asia and Europe. We would like to thank all the volunteers involved in allowing the tour to run smoothly and believe it was a truly wonderful experience for everyone that joined. We would also like to appreciate the Turkish families who happily accepted hosting the group for dinner on some nights.